Over the next few issues of ResuemMag we’ll look into some specific careers, providing you with a little information on what opportunities there may be, different paths to take, what you need to know and how much you can expect to make. In today’s issue we’ll take a look at accounting jobs. Accountants are responsible for keeping track of an organization or an individual’s finances. Typically they will prepare reports that will be used to determine how a company is doing financially. Accountants will also prepare Government tax reports for organizations and individuals. Because of the exacting nature of their responsibilities, a professional accounting resume can be an important first step to getting hired. In general, the work environment is a standard office setting with a 40 hour week, which may increase during the tax season. However some accountants may be required to travel, especially those that perform audits either on a government or public level. Public Accountants work for public accounting companies, whether it is through their own business or for an accounting firm. Their main clients are typically individuals, but they may also do accounting for small business owners as well. Typically a Public Accountant will perform a mixture of accounting, auditing, tax, and consulting work. Management Accountants are in house accountants that manage the money for the companies they work for, preparing things like financial reports for managers and tax reports for the Government. Government Accountants work for government agencies ensuring that the tax dollars are being spent correctly. They may also help to keep track of the finances of individuals and organizations doing business with the government. According to the United States Department of Labor’s Bureau of Labor Statistics in 2008 there were 1.3 million accountants and over the next 7 years that employment rate is expected to grow faster than all other occupations. 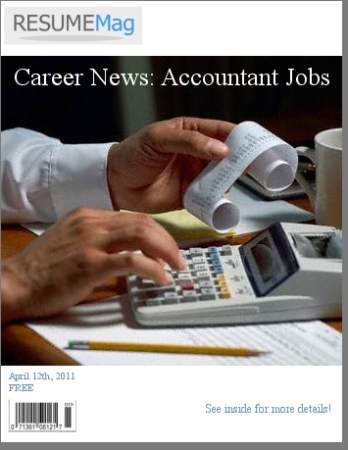 The same statistics show that in May 2008 the average yearly wage of accountants was $65,840. Most accountants have a college degree in accounting and all public accountants are required to take a special test in order to earn a certification as well as be licensed in the State in which they practice. If you have any specific careers you would like us to cover in upcoming issues please leave a comment, send us a message or get in contact with us on Twitter.